A great blue heron wades cautiously through shallow waters as tall reeds and cattails sway softly in the breeze. On shore nearby, small sandpipers flick through the mud with their thin beaks and the rolling call of a red-winged blackbird reveals his presence somewhere in the grass. Overhead, a Caspian tern flies in circles while watching the water carefully, preparing to dive for his next meal. This charming scene is not dreamed up from visits up north, nor even from the countryside surrounding Waterloo, but a scene I witnessed right here on the University of Waterloo campus. More specifically, at the series of lakes, creeks and ponds north of Columbia St., scattered throughout the David Johnston Research & Technology Park. While these water bodies are largely artificially made in the interests of flood control and stormwater management, they double duty as an important natural oases in an urban landscape ,and can therefore be great hotspots for spotting wildlife — as long as one learns to look closely. I learned this lesson for myself when I went bird-watching in Toronto this past winter with the Toronto Ornithological Club. As we marched through knee-deep snow along the frozen Humber Bay waterfront, surrounded by condominium towers and the whirring of the Gardiner Expressway, I doubted we would find any wildlife at all, let alone new and interesting species. But when the trained eyes I was with urged me to look more closely at a seemingly endless flock of plain mallard ducks, I noticed species I had never seen like goldeneyes, buffleheads, and the stunning and regionally uncommon northern pintail duck — all hiding in plain sight among the ordinary. 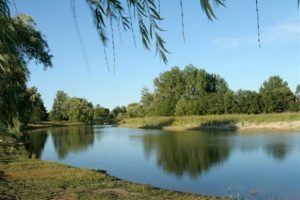 When I returned to Waterloo, I noticed that the aforementioned ponds I had once considered as filthy and an ecologically barren stormwater management ponds were actually buzzing with a myriad of creatures. The pond next to the Laurel Trail just south of the new LRT stop is home to a great blue heron, often hiding among the reeds on the shallow, sandy strip in the middle. I’ve seen the Caspian tern, distinct from the common herring gulls and ring-billed gulls by its bright orange beak and black face. There are innumerable spotted sandpipers, camouflaged by their dull brown plumage darting along the mud and reeds. Laurel Creek is even home to muskrats, the large rodents which once played an integral role in the fur trade. Even on the ornithological record-keeping site eBird, used by citizen scientists and researchers to record bird sightings, Columbia Lake is listed as a regional hotspot for birdwatching. There are recorded sightings for literally hundreds of bird species including the relatively rare great egret, merlin, tundra swan, great horned owl, and even a bald eagle. So, next time you’re feeling trapped on campus — or Waterloo in general — and itching for a taste of nature, try going for a walk. You might be surprised what you’ll see if you look closely.